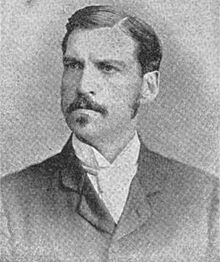 Lloyd Stephens Bryce (September 4, 1851 – April 2, 1917) was a U.S. Representative from New York and prominent magazine editor. Lloyd Bryce was born in Flushing, New York on September 4, 1851. His father, Joseph Smith Bryce (1808–1901), graduated third in his class from the United States Military Academy in 1829, Robert E. Lee was second, and served as a Union Army Major in the Civil War, engaged in the defense of Washington, D.C. Lloyd's sister was Clemence Smith Bryce (1847–1908), who married Nicholas Fish (1846–1902), the U.S. Ambassador to Switzerland and Belgium, and was the mother of Hamilton Fish (1873–1898). He was a nephew of John L. Stevens (1820–1895), U.S. Minister to the Kingdom of Hawaii. He attended Georgetown University, Washington, D.C., and Christ Church, Oxford, where he graduated with bachelor's and master's degrees. Bryce also studied at Columbia Law School. Bryce was an avid sports enthusiast, and wrote that sports were capable both of quelling revolutionary thought among the poor and promoting understanding between nations. He was a frequent participant in polo matches in Newport, Rhode Island and Manhattan and fox hunts on Long Island. Bryce, a Democrat, became interested in politics. In 1886, Governor David B. Hill appointed him to the governor's staff as Paymaster General of the militia with the rank of Brigadier General, a largely ceremonial position. Afterwards he was known as General Bryce. Bryce was elected as a Democrat to the Fiftieth Congress (March 4, 1887 – March 3, 1889). He was an unsuccessful candidate for reelection in 1888 to the Fifty-first Congress. He was appointed Minister to the Netherlands on August 12, 1911, and he served until September 10, 1913. His friend C. Allen Thorndike Rice, the editor and owner of the North American Review, died unexpectedly in 1889 and left the magazine to Bryce in his will. Bryce was the owner and editor from 1889 to 1896. Influenced by his experience in Congress he wrote an early "Yellow Peril" story, called Dream of Conquest for the June 1889 issue of Lippincott's Monthly Magazine. His other published works include: Paradise: A Novel (1888); Romance of an Alter Ego (1889); Friends in Exile (1893); and Lady Blanche's Salon (1899). Cornelia Elizabeth Bryce (1881–1960), who married conservationist Gifford Pinchot (1865–1946), the first Chief of the United States Forest Service under Theodore Roosevelt, in 1914. Peter Cooper Bryce (1889–1964), who married Angelica Schuyler Brown (1890–1980), of the Brown banking family, in 1917. Bryce died in Mineola, New York, April 2, 1917, and was interred in Greenwood Cemetery, Brooklyn, New York. The bulk of his estate, worth $1,665,061, was left to his two daughters, with his son receiving all his paintings, including a portrait by Godfrey Kneller, books, engravings, and clothing. His home at 1025 Fifth Avenue was left to his children in four equal shares, two to his son and one to each of his daughters. His grandson, Henry Sergeant Cram (1907–1997), married Edith Kingdon Drexel (1911–1934), the granddaughter of Anthony Joseph Drexel, Jr. and George Jay Gould I, in 1930. Cram later married Ruth Vaux, a granddaughter of Richard Vaux, after his first wife's death. His granddaughter, Edith Bryce Cram (1908–1972), married Arthur Gerhard in 1950. ^ Foster, Joseph (1888–1892). "Bruce, Lloyd Stewart" . Alumni Oxonienses: the Members of the University of Oxford, 1715–1886. Oxford: Parker and Co – via Wikisource. ^ "Polo at Newport". The New York Times. 29 August 1878. Retrieved 23 May 2017. ^ "Ex-Gov. Morton Entertains". The New York Times. 16 October 1899. Retrieved 23 May 2017. ^ Times, Special To The New York (4 September 1900). "Burglar in Newport Cottage". The New York Times. Retrieved 23 May 2017. ^ "Notes of Foreign Affairs". The New York Times. 25 June 1912. Retrieved 23 May 2017. ^ "A Bright May Wedding – Marriage of Miss Cooper and Mr. L.S. Bryce – The Scenes and Services at All Souls' Church Reception at the House of Mr. Peter Cooper – A Few of the Guests". The New York Times. 1 June 1879. Retrieved 23 May 2017. ^ "Mrs. Bryce Left $6,921,810 – Estate Goes to Children and Grandchildren". The New York Times. 3 April 1918. Retrieved 23 May 2017. ^ "Mrs. Lloyd Bryce Buys Eighty Acres". The New York Times. 24 August 1899. Retrieved 23 May 2017. ^ "Mrs. Bryce Left $3,000,000. Husband and Son Principal Beneficiaries Under Will". The New York Times. 7 June 1916. Retrieved 18 October 2015. ^ "Mrs. J.S. Cram of Peace House Founder of Pacifist Group Dies". New York Times. February 29, 1960. Retrieved 2015-10-01. ^ "Funeral for J. S. Cram – Rites for Former Public Service Commissioner in Grace Church". The New York Times. 23 January 1936. Retrieved 23 May 2017. ^ "Mrs. Gifford Pinchot Is Dead; Widow of Governor Was 79; Ran for Congress Twice - Sought Husband's Post in Pennsylvania in 1934". The New York Times. 10 September 1960. Retrieved 23 May 2017. ^ "Gifford Pinchot Weds Miss Bryce – Progressive Senatorial Nominee Marries Daughter of Gen. and Mrs. Lloyd S. Bryce – Quiet Nuptials at Roslyn – Col. and Mrs. Roosevelt, ex-Ambassador Bacon, and Mr. and Mrs. J.R. Garfield Among Guests". The New York Times. 16 August 1914. Retrieved 23 May 2017. ^ "Cornelia Bryce Pinchot (1881 - 1960)". fs.usda.gov. United States Department of Agriculture | Forest Service. Retrieved 23 May 2017. ^ Redmon, Michael (28 July 2009). "The Bryce Estate". Santa Barbara Independent. Retrieved 24 May 2017. ^ "Her Wedding Is Hastened By War – Miss Angelica Schuyler Brown Marries Peter Cooper Bryce of Squadron A – A Quiet Home Ceremony – Guests Include Attendants Chosen for Church Nuptial – Bridegroom Son of Ex-Minister to The Hague". The New York Times. 8 April 1917. Retrieved 23 May 2017. ^ "Bryce Estate Appraised – Ex-Minister to Netherlands Left Property Worth $1,665,061". The New York Times. 25 October 1918. Retrieved 23 May 2017. ^ a b "Lloyd Bryce Left $100,000 – Bulk of Ex-Minister's Estate Was Left to His Two Daughters". The New York Times. 11 April 1917. Retrieved 23 May 2017. ^ World, Photo By Wide (6 May 1931). "Edith Drexel Weds H. Sergeant Cram – Members of Two Prominent Families Married in St Bartholomew's – Society Fills the Edifice – Floral Decorations Elaborate--Bride Has Nine Attendants--Many Philadelphians Present". The New York Times. Retrieved 23 May 2017. ^ Times, Special To The New York (8 October 1936). "Henry Cram to Wed; Miss Ruth Vaux – Son of Mrs. J. Sergeant Cram of New York Is Affianced to Philadelphia Girl". The New York Times. Retrieved 23 May 2017. ^ Times, Special To The New York (26 March 1950). "Edith Bryce Cram Is Wed in Chapel – Descendant of Peter Cooper Bride of Arthur Gerhard at Church of Heavenly Rest". The New York Times. Retrieved 23 May 2017. United States Congress. "Lloyd Bryce (id: B000998)". Biographical Directory of the United States Congress.